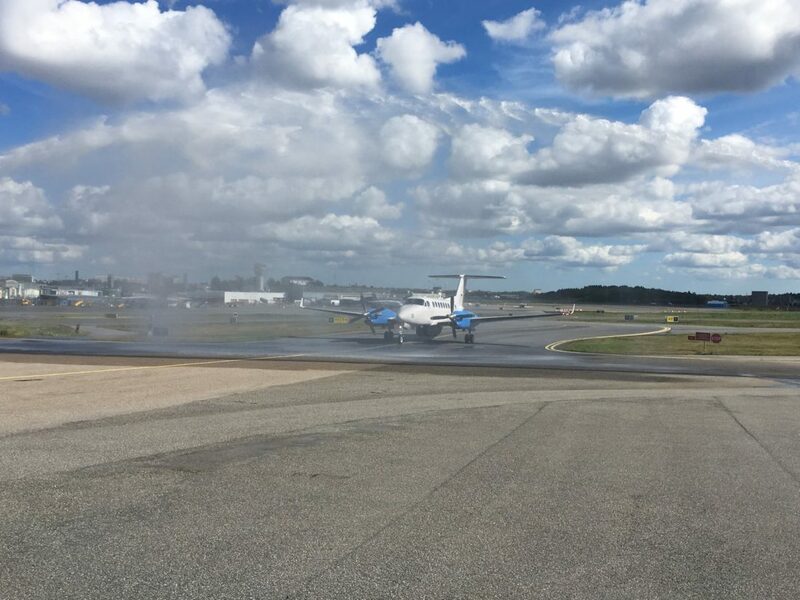 Estonia’s new Beech King Air 350 arriving in the beginning of August at Bromma Airport from the aircraft factory in the U.S. It received a salutory spraying and cleaning as a welcome. ST Airborne Systems is in cooperation with Bromma Air Maintenance providing a new MSS 7000 equipped aircraft for the Ministry of Interior of Estonia. Bromma Air Maintenance will perform the required modifications of the aircraft, install the MSS 7000 system, and finalize the paint scheme in the colors of The Estonian Police and Border Guard. The aircraft will be used for environmental patrol and aerial surveillance of the sea and land areas under Estonian responsibility. Delivery is planned for May 2018. The Estonian Border Guard has operated their MSS 6000 system onboard a LET 410 aircraft since 2007 and will be the first to get the new MSS 7000 system.